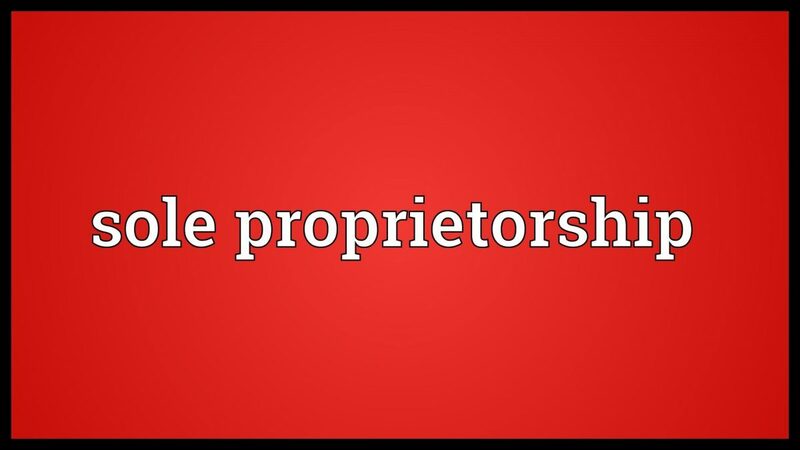 A sole proprietorship is a form of business which is individually owned by a person. It is also known as a single trader or just proprietorship. This is a type of business entity in which there is the only single owner who starts a business with an objective to earn a profit. As there is only single owner all the profit and the losses are borne by him only. When it comes to liability the sole proprietor has an unlimited liability that means he is liable to pay the debts and the losses of the company. The sole proprietorship is suitable for that business which is of small size. Investment in these kinds of business is limited. It can be opened by those persons who want to individually run a business on a small size. Single owner- any individual who wish to start a business on their own to earn some profit can form a sole proprietorship. Only a single individual is required for the formation. It can be easily formed without many formalities. Limited capital- As there is only a single person in the business; capital invested by him is limited. This is a disadvantage to this form of business because, for a business, investment is very important. The single owner is not able to contribute towards business which leads to hindrance in its growth process. Unlimited liability- sole proprietor has unlimited liability which means that he has to use even its own assets for paying debts of the company. This also serves as a disadvantage to this kind of business. Existence- Death of the proprietor affects the life of the business. There is no perpetual succession in the business. As there is only a single owner, on the death of him no person can take over the business as per the provisions. The business will come to an end on the death of its owner. The single bearer of profit and loss- Profits and loss are borne by the individual only. In the case of any profit that a business earns or any loss that a business received is borne by the sole proprietor only. He cannot shift the charge off losses on other people. Less procedure- Forming a sole proprietorship is easy and less complicated as compared to other forms of business. It doesn’t involve huge paperwork. It can be easily formed by a single person without many formalities. Easy business closure- Business can easily be closed on the will of the proprietor. The proprietor can sell all its property easily without many complications. Management autonomy- The individual can manage the whole business on his will. He doesn’t have to ask for permission from any other person. He is the boss and he can manage its affairs individually. Change in legal structures- If at any point of time the proprietor wants to change its business legal structure, he can change it easily. Changing its legal structure doesn’t involve much time and efforts. Limited life of a business- On the death of the single owner the business comes to its end. As there is no person to carry on the business, therefore, it comes to the end. Unlimited liability- The liability of the proprietor is unlimited to its personal assets also. He is liable to pay the company debts and losses. Decision making- The responsibility for taking all the decision comes to the individual only. A single person cannot specialize in all perspectives therefore in a business it is necessary to have few people for decision making. In this decision-making lies in the hands of just one person which proves as a disadvantage to the company. Limited capital- Capital invested is just by one person, therefore, it is limited. For business growth and survival, a huge capital requirement is needed and absence of huge amount of capital from sole proprietorship proves as a limitation to its functioning. VAT/TIN Registration – VAT and TIN number are required to obtain by every proprietorship for sale of goods and services. Service tax- Service tax registration is required for all types of service providers. Without obtaining its registration no person can provide services. Professional tax registration- Every business which is employing any kinds of professionals such as auditor has to obtain professional tax registration. ESI/ PF registration – For very business having employees has to obtain its provident fund registration. There is no registrar for a sole proprietorship in India. Therefore sole proprietorship can work under any name without having its name problem till it doesn’t have any problem with trademark registration. So if an individual wants to conduct its business without any restrictions then it is recommended to obtain a trademark registration. Food business operating license- Obtaining food business operating license is necessary for all those businesses who are operating in the line of food. Customer broker license- It is a kind of license which acts like a customer broker. Security Agency license- It is a kind of license required for all kinds of security services. Shop and establishment license– For businesses operating shops or any establishment this license is required.For more information please visit legalraasta..
Value added tax i.e. VAT is applied to all goods which are sold within India. Irrespective of the type of business involved any person who is dealing with manufacturing or trading goods need to obtain VAT registration. VAT registration can be obtained using proprietor PAN card. As soon as the VAT registration is obtained business should start filing VAT tax returns. For all micro, small and medium enterprises registration is obtained MSME act. It can be obtained easily. There are certain firms which provide services to other firms. For those firms tax registration is necessary. For service providing businesses, service tax registration is required which can be easily obtained from service tax department. As soon as service tax registration is obtained by the business, the filing of return of the service tax should be started.